North Omaha is home to more than 150 historical places, and a growing number of these sites are being recognized with historical markers. These markers have been placed by a number of organizations over the years, including the City of Omaha, Daughters of the American Revolution, high school groups, and the Nebraska State Historical Society. 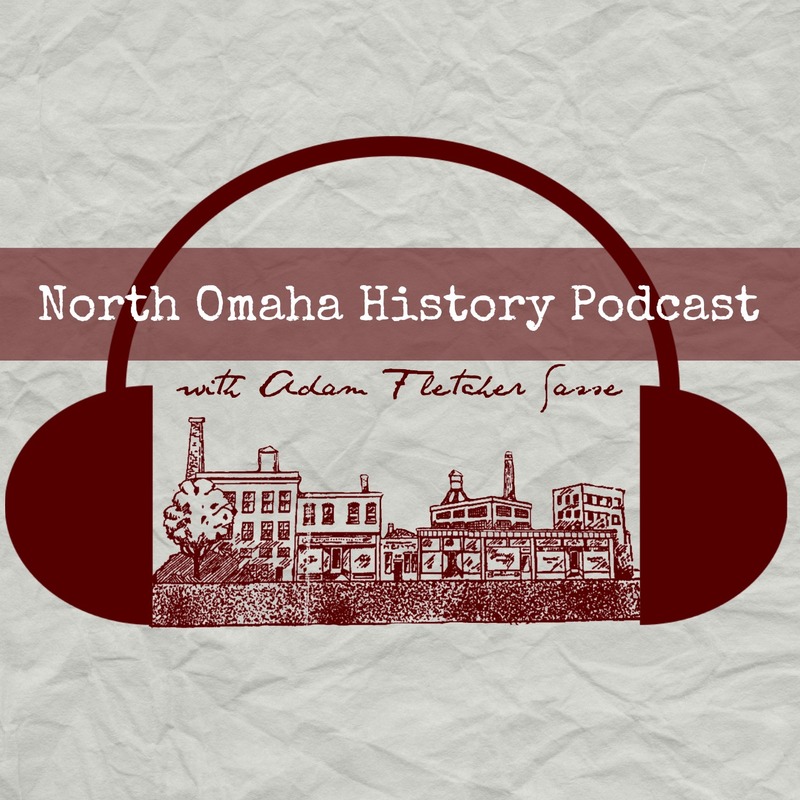 Following is a list of historical markers in North Omaha. 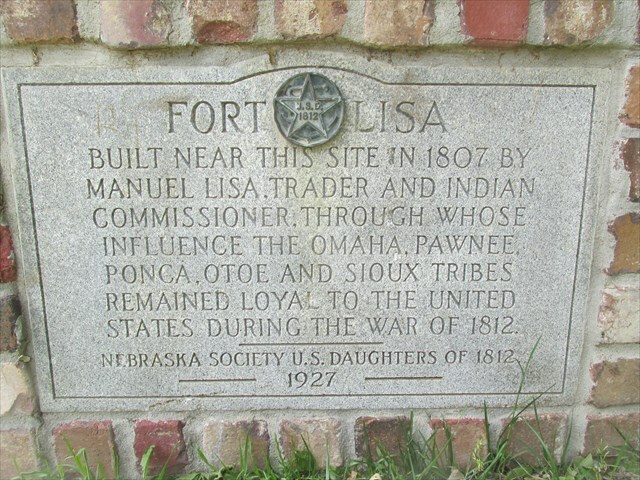 This historical marker in North Omaha identifies Fort Lisa, listed below. A Little Town That Dreamed of Greatness — Marks the former town of Florence. Located by N. 30th and Willit Streets on the east side. Mildred Brown — Marks the site of an Omaha journalism great with a memorial bust and more. Located at in the Mildred Brown Strolling Park. Martin Luther King Jr Cornerstone Memorial — Marks a commemoration of the life of Rev. Dr. King. Located on the northwest corner of N. 24th & Lake Streets. Florence City Hall and Jail — Marks the location of the original Town of Florence City Hall and Jail. Located at 8415 North 29th Street. Florence Firehouse — Marks the location of the original Florence Firehouse. Located at 8415 North 29th Street. Territorial Legislature — Marks the location of the 1856 site of an illegitimate meeting of part of the Nebraska Territorial Legislature resulting from a dispute. Located at 8517 N. 30th Street. Florence Freedom Tree — Dedicates a tree to soldiers. Located at 8509 N. 30th Street. A Meeting House for the Saints — Marks the site of the Mormon meeting house. Located south of N. 30th and McKinley Streets on the west side. Florence Opera House — Marks the site of Nebraska’s first opera house. Located at 8507 N. 30th Street. From Indian Lands to the Golden Gate — Marks the peoples who have lived in the area, including the Oto, Missouri, and Omaha Indians; Frenchmen, Canadians and Spaniards; and others. Located by N. 30th and Willit Streets on the east side. Mormon Pioneer Memorial Bridge — Marks the crossings made by the Mormons near this marker. An official marker of the Utah Trails and Landmarks Association. Located at N. 30th and Willit Streets. The Mormon Pioneer Trail — Marks the path traveled by pioneer Mormon settlers. Located at 30th and McKinley Streets. Cutler’s Park — Marks the location of a Mormon settlement dating from 1845. Located across from Omaha Home for Boys Cooper Farm at 8502 Mormon Bridge Road. Bank of Florence — A secondary marker markers the location of the bank. Located at N. 30th and Willit Streets. The Florence Mill — Located at 30th and McKinley Streets. The Road to Zion — Marks the large scale migration of the Mormons to Utah. Located at 30th and McKinley Streets. Mormon Pioneer Campsite — Marks the area where the Mormons located a campsite on their way west. Placed in 1947 by the Daughters of Utah Pioneers. Located on the south edge of the North Omaha airport on N. 72nd Street and Highway 36. Fort Omaha — Almost 15 years after the city was founded, in 1868 a military barracks was started in Omaha. The US Army and US Navy have been housed here in some form since then. Placed by the Nebraska State Historical Society. Located at N. 30th and Fort Streets. Erected by the Daughters of the American Colonists, Historical Land Mark Council. Fort Omaha Balloon School — In 1909, the first-ever free balloon filled with hydrogen left the Fort. Located in Fort Omaha at N. 30th and Fort Streets. Fort Omaha Fire Station — Originally a filtration plant constructed in 1912, this building was remodeled and enlarged to become the Post Exchange Building in 1923. Located in Fort Omaha at N. 30th and Fort Streets. Fort Omaha Guardhouse — Drunkenness, insubordination, fighting and desertion led officers to punish offenders here. Located in Fort Omaha at N. 30th and Fort Streets. Fort Omaha Headquarters Building — Marks the double barracks building that housed noncommissioned officers of the U.S. Army Signal Corps. During World War I, this building served as South Post Headquarters for the Army’s first balloon training school. In 1929 it became Staff Officers Headquarters of the Seventh Corps Area. Between 1933 and the end of World War II, the building served the dual roles of barracks and Post Commissary. Located in Fort Omaha at N. 30th and Fort Streets. Fort Omaha Hospital — Marks the location of the Fort hospital, used for more than 75 years. Located in Fort Omaha at N. 30th and Fort Streets. Fort Omaha Knights of Columbus Assembly Hall — Marks the location of the Red Cross canteen, YMCA and the Knights of Columbus at the Fort during World War One. Located in Fort Omaha at N. 30th and Fort Streets. Fort Omaha Officers Row — Marks the pioneer-era brick homes of hundreds of officers throughout the US Army’s 100 years of usage of the Fort. Located in Fort Omaha at N. 30th and Fort Streets. Fort Omaha Post Exchange and Gymnasium — Marks the emergence of physical health as a distinct issue within the US Army. Located in Fort Omaha at N. 30th and Fort Streets. Fort Omaha Quartermaster Depot — Marks the building where supplies went to US Army outposts across the western US. Located in Fort Omaha at N. 30th and Fort Streets. General Crook’s Headquarters at Fort Omaha — Marking the Headquarters of the Platte when it was at the Fort. Located in Fort Omaha at N. 30th and Fort Streets. Observation Balloon Training at Fort Omaha — Marks the location of the Signal Corps officer training school at the Fort. Located in Fort Omaha at N. 30th and Fort Streets. Ordnance Magazine — Built in 1884, the ordnance magazine was the chief storage place for weapons and ammunition. Located in Fort Omaha at N. 30th and Fort Streets. President’s House — Marks one of the new houses built when Fort Omaha was re-established in 1905 to house four Signal Corps companies. Located in Fort Omaha at N. 30th and Fort Streets. Bourke Gate — Marks the location of a historical entrance to the Fort. Located in Fort Omaha at N. 30th and Fort Streets. Shiverick Gate Marker — Marks the location of a historical entrance to the Fort. Located in Fort Omaha at N. 30th and Fort Streets. Spanish-American War Memorial — Marks the commemoration of the war, including names of Omahans who died in it. Located in the Prospect Hill Cemetery. Belvedere Point Lookout — This location might have been visited by Lewis and Clark, and offers a great view of the Missouri River Valley. Johan and Sophia Ahmanson — Norwegian missionaries for the Mormon Church, this couple died in North Omaha. Placed by the Prospect Hill Cemetery Association. Located in Prospect Hill Cemetery, 3202 Parker Street. Fort Lisa — Marks the area where Spaniard Manuel Lisa operated a fur trading post here by the Missouri Fur Trading Company with the Omaha, Pawnee, Ponca, Otoe and Sioux tribes. Located in Hummel Park near J. J. Pershing Drive and Ponca Road. John Pierrre Cabanne’s Post — Marks the area of a pre-pioneer fur-trading post operated by the American Fur Trading Company that conducted a brisk business with area tribes. Located in Hummel Park near J. J. Pershing Drive and Ponca Road. 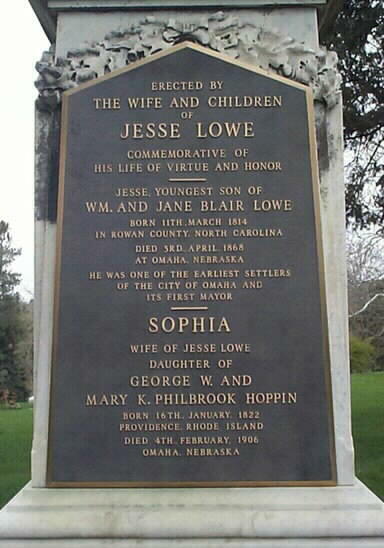 Gravesite of Jesse Lowe — Marks the burial site of the first Mayor of Omaha. Located in Forest Lawn Memorial Park at 7909 Mormon Bridge Road. Civil War Monument— Marks a Civil War monument located in the veterans section, and includes four cannons. Monument dedicated in 1892. Located in the Forest Lawn Memorial Park at 7909 Mormon Bridge Road. 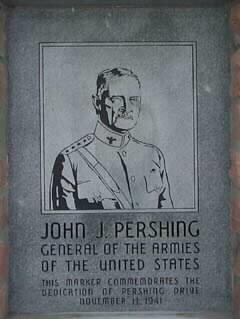 John J. Pershing Drive — Marks the dedication of the roadway named in honor of “Blackjack” Pershing. Located on J. J. Pershing Drive here. Potter’s Field — Marks the location of Omaha’s longtime cemetery for poor, unknown and unclaimed burials. Located next to the Forest Lawn Memorial Park at N. 48th and Young Streets. 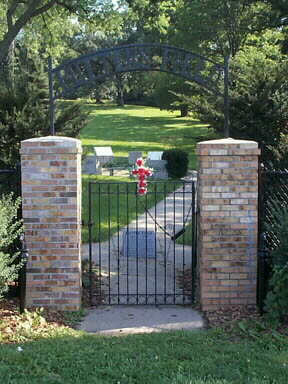 “Lest We Forget” WWI Memorial — Marks the location of a monument placed by the Omaha Chapter of the American War Mothers. Located at the intersection of Minne Lusa Boulevard and Redick Ave.
Nebraska School for the Deaf — Marks the location of a segregated school that lasted for a century. Placed by the Nebraska State Historical Society. Located at 3223 N 45th Street.